Kia's subcompact cousins, the 2016 Rio and Rio 5-door, might be inexpensive, but you'd never know that from looking at the pair. 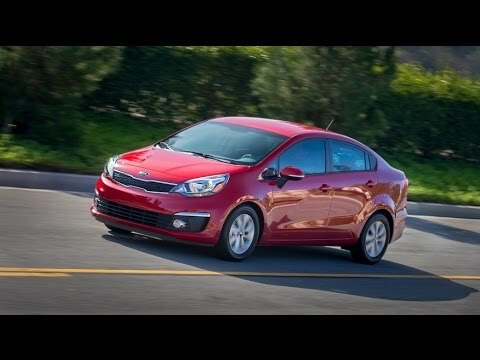 Stylish and loaded with features, the fuel-sipping Kia Rio makes a great first car or second commuter. The Rio's 10-year/100,000-mile powertrain warranty is an added bonus in this price segment. Sporty and reliable car for a competitive price! I have had my car for two years and, so far, it has been very reliable and comfortable. I do wish my car had an armrest. It is a small thing but I actually really miss it on long drives. My car does accelerate slower than my previous vehicle but, for the cost, I really shouldn't complain. I have had no maintenance fees except for the basics - oil, fluids, etc. And, overall, I am extremely pleased with the aesthetics and function of my vehicle considering the competitive price. Reliable and durable get you where you need to go. The car is reliable and I haven't had any issues with it. I have the base model, but that comes with a trial of Sirius XM and Bluetooth. I wish it came with cruise control as well but it is ok. It has a setting that can help save fuel so it can be efficient on gas. It is also cheap to fill. I can spend about $20 and get a full tank of gas. It also shows how many miles until you need gas, a full tank usually gets me 300 miles. I great car at a reasonable price. This model year Kia changed the body style. It appears to be an updated version of the 1990 Honda Civic hatchback. The Kia rio comes with full amenities such as power doors windows and remote start. One of the coolest features is the AUX plug for using your smart devices. Gas mileage is very good, with its 1. 6 l engine has an output of 138 hp. Interior trim is exceptional for stain resistance and general ease of cleaning.